A total of 528 hardy folks showed up on January 26th and February 23rd to experience some outdoor fun with family and friends as they snowshoed by torchlight at Camp Daggett. After snowshoeing, they came in from the cold for a delicious cup of hot chocolate, freshly baked cookies, or warm up by the crackling fire in Camp’s beautiful main lodge. Admission was free. 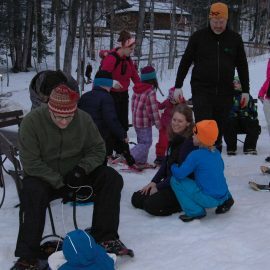 Bearcub Outfitters provides snowshoes for all ages who might not have snowshoes of their own. Raffle tickets were available for purchase to win great Bearcub Outfitter products with all proceeds going to Camp Daggett. These two events are sponsored by Bearcub Outfitters to promote all that Camp Daggett offers children and the community. Mark your calendar for next year, January 28, 2020 and February 29, 2020.